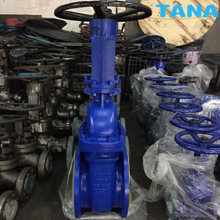 Cast steel gate valves can only be fully opened and fully closed to be used for cutting in the pipeline.The entire flow channel is a straight-through passage when the valve is fully-open, and the pressure loss of medium running is minimum.Gate valve is usually for working condition in which the valve is not opened or closed frequently, It's not suitable for adjustment or throttling.The most important feature of the cast steel gate valve of TANA machine is that they can be ensured that the permissible leakage rate can be lower than that specified in API 6D and API 600, and the middle shaft sealing can pass the USA VOC leakage test. Carbon Steel, Stainless Steel, Alloy Steel, Duplex Steel may be selected for transportation of water, steam, oil, natural gas, nitric acid, acetic acid, oxidant and urea. Cast iron gate valve provides full flow with minimal pressure drop. 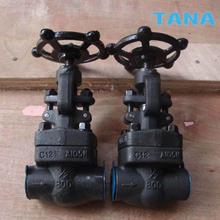 The cast iron gate valve has flat face end connection for easy installation and accessibility. 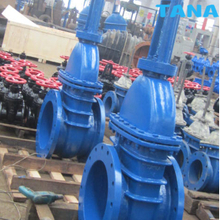 Outside screw and yoke (OS&Y) and Non-rising stem gate valves structure,Outside screw and yoke (OS&Y) gate valves are recommended when positive shutoff and a quick visual indicator of open/closed position is required. 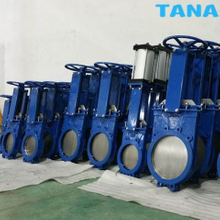 Non-rising resilient seated gate valves solve the problem in general gate valves such as leakage, rusting etc.and saves installation space.Bolted bonnet, Solid wedge, Iron body bronze mounted (IBBM), flanged flat face end connections. 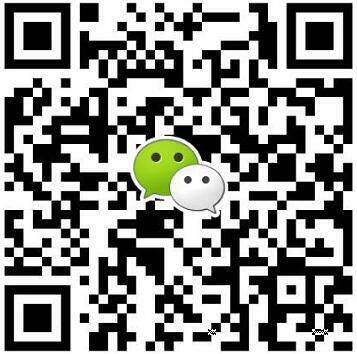 Conforms to MSS SP-70 DIN3352,BS5163,KS B 2350. 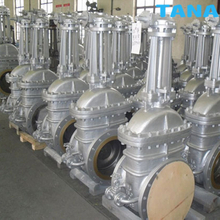 TANA forged steel gate valves have set their own standards in many industries, much like our super-specialty valves. Rotary table surface grinding and imported lapping machines ensure a fine surface finish of 100% leak-tightness. The trim materials is hardened and tempered for higher durability and performance. Further stellited trim can also be provided. 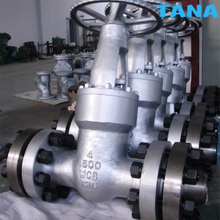 The valves offered can meet both API and BS Standards requirements. 1) Self-sealing high-pressure valve allows the structure of the valve body, valve cover tight junction structure, the provincial Public Works save cost, safe and reliable. 2) valve pressure in the valve cover seal, the use of the modular structure to achieve linear sealed its seals at the same time the use of austenitic stainless steel, anti-cavitation, extended life, thereby ensuring that the valve seal under high-pressure differential did not leak. 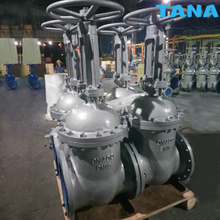 TANA Bypass gate valves have the back seating design.For stainless steel gate valve, the back seat is machined directly in the bonnet or is machined after welding .When the gate valve is at fully open position, the sealing of the back seat can be very reliable .However, as per the requirement of API600, it is not advisable to add or change packing by the mean of back seating when the valve is pressure containing. 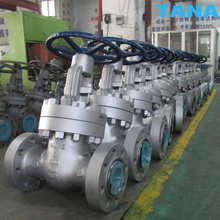 Slab Gate Valves(Parallel type gate valves, Through Conduit Gate Valves)are widely used in oil, natural gas long-distance pipelines and gas fields as open/close control valves. 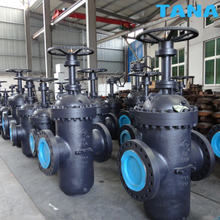 Valves used in forging or casting body, the gate designed with diversion holes, non-diversion holes; single plate and double plate structure; Seat used bi-direction seal seat which mainly based on the metal seat sealing and assisted with soft seat sealing as a second type of seal. The series of parallel type gate valve has rational design, compact structure, sulfur resistance, corrosion resistance, wear-resistant, reliable sealing, and light torque of switches, easy-to-use. Gost standard gate valve use a combination of die-formed flexible graphite and interbraided graphite in a predetermined arrangement to ensure an effective seal.Graphite packing achieves its maximum ability to isolate the atmosphere when it is contained within a chamber that is precise in finish and dimension.The cast steel russian standard gate valve. Wenzhou Topnotch Machine Co.,Ltd is a professional leader China Pressure seal gate valve,Knife gate valve,Cast steel gate valve,DIN standard Gate Valve,Cast iron gate valve,bolted bonnet gate valve,Flanged gate valve,api 6D slab gate valve manufacturer,cast steel gate valve,125lb cast iron gate valve manufacturers and suppliers with high quality and low price.Welcome to contact us!